The constant trail of British politicians, ministers, members of the House of Lords and Members of the Royal Family to the Kingdom of Bahrain is an unnerving reminder to the Bahraini people that Britain has not got their back when it comes to democracy. Why would we? We ran the place as a colony for decades, then helped architect a brutal state security apparatus that, to this day, torments pro-democracy activists in the dungeons under Manama. In recent years, both the US and the UK have sent over police “reformers,” who according to the few human rights activists remaining in Bahrain, have only made matters worse. Nearly forty deaths have been attributed to the excessive use of teargas since 2011. The torture methods used by police interrogators have become more common-place and the perpetrators act with impunity. Bahrain is going backwards on promised human rights reforms, and British police consultants have no doubt played a key role in violently attacking the protesters who make it out onto the streets each day. Two of these men, John Timoney and John Yates, are ex-policeman, independent consultants with backgrounds in the New York Police Department and London’s Metropolitan Police, who have got rich off advising the Bahraini police on how to “reform.” It is regrettable that ambassadors for policing, sent from the West, have overseen such a disastrous, deadly and repressive strategy deployed over a number of years against admirable pro-democracy protesters. The men were appointed together, in December 2011, amid much media controversy. That John Timoney is a big fan of teargas as a way to police protests is cause for concern, especially given the propensity of the government to use it. Earlier this year, the South Korean government was so concerned about tear-gas being over-used on Bahraini protesters they banned a local manufacturer from exporting any more. The Bahraini government had placed an order for 1.6 million tear gas canisters, 90,000 tear gas grenades and 145,000 stun grenades. All these are preferred crowd-control weapons for John Timoney, based on reports of his policing methods at mass protests in Miami and Chicago. Despite South Korea’s concerns, back in New York, Timoney had been a firm advocate of non-lethal weaponry to stop protest. In one surreal incident, Timoney even teargassed himself to impress upon city lawmakers that tear gas was highly effective. But his excessive use of the gas while employed by American police forces, alongside militaristic tactics used against peaceful protesters, earned him the nickname “The Worst Cop in America” and generated hundreds of complaints from injured activists and human rights groups. The US State Department always denied they had any hand in Timoney’s appointments. But an email from a “Regional Security Officer” to a government intelligence contractor (Stratfor) amongst the Wikileaks cables prove otherwise, as I recently revealed. This consequently raises the spectre that Timoney’s British colleague, John Yates, who left the Metropolitan Police in disgrace following the phone hacking scandal, may also have been placed in Bahrain at the behest of the British government, and that they, too, could be lying when they say Yates’s appointment is nothing to do with them. The Foreign Office deny any involvement with Yates now he has left the UK, and won’t comment on his work In Bahrain. They argue he is an independent contractor and no longer a state employee, so they cannot make statements on his behalf. However, not only is the parallel with Timoney’s appointment interesting, but a precedent set by a colonial-era policeman – Colonel Ian Henderson, also suggests the Foreign Office may be lying. lkins goes on to describe how Henderson is credited with transferring the torture techniques he perfected as a member of the Kenyan Criminal Investigation Department to repression of the Mau Mau. Denouncing his interrogation techniques as “unspeakable” she details how an “investigation” led by Henderson ultimately resulted in the hanging of Mau Mau leader, Field Marshal Dedan Kimathi. This was not a man afraid to police aggressively in the name of the Empire. Following his deportation, Henderson moved to Bahrain and implemented a new state security apparatus at the behest of the Bahraini government. As head of Bahrain’s security services for nearly thirty years, Henderson was to be accused of complicity in torture of political prisoners during the period of protracted social unrest that Bahrain experienced in the mid to late 1990s, leading to an investigation by British authorities in 2000. The investigation was concluded the following year,and no charges were filed. He always denied involvement in torture up until his death last year aged eighty six. But much of the state security apparatus that he set up has endured. Torture continues largely unaddressed. It will be hard to concretely link the role that Timoney, Yates and Henderson have played in Bahrain’s Arab Spring repression unless key files from the British and American government are either leaked or declassified. The British and American governments admit to meeting with all three men on a regular basis, but insist this was part of diplomatic observations and doesn’t implicate either in torture. It is not just British policemen playing their part in Bahrain’s woes. The UK’s current “Human Rights Minister,” Baroness Warsi, has also been prepared to drop her brief in pursuit of sanitising Bahrain’s reputation abroad. Last month, she was overjoyed to host an Islamic finance summit designed to drum-up business between Manama and London. The event was announced in official channels by both the British and Bahraini governments. William Hague, our Foreign Secretary, has been very transparent in recent months that “human rights will not be put before trade,” but the appointment of Baroness Warsi, supposedly an official advocate of human rights, to this cynical trade mission smacks of hypocrisy. Why couldn’t a Minister within the Department of Business Innovation and Skills have hosted the meeting? Her role spits in the face of pro-Bahraini democracy activists, who consistently tell the British government that that never-ending trade deals with Bahrain legitimise the regime’s oppression. If you take a job as Human Rights Minister, Baroness Warsi, try actually protecting people’s human rights. And for a so-called advocate of faith (she also holds a ministerial brief for religion in the UK), Warsi is remarkably blind when it comes to Bahrain’s religious oppression of Shia Muslims. Just in the last month, Iranian Press TV has reported on regime forces storming a mosque and arresting and intimidating a Shia preacher. The Bahraini regime, which is dominated by Sunnis from senior to junior levels, has a long-standing tradition of oppressing Shi’ites. None of this appears to concern Warsi. Warsi is not the only government Minister throwing her lot in with the Bahrainis. A Google Image search for “British Minister Khalifa” shows just how brazen and unrepentant many members of successive British governments have been in supporting the dictatorial al-Khalifa monarchy in Bahrain. Dozens of photos show up, most taken since the Arab Spring in Bahrain began back in 2011, but many from the years previous. David Cameron has welcomed the repressive al-Khalifas to Number Ten, Foreign Office Minister Hugh Robertson also courts the al-Khalifas regularly, as do numerous foreign policy wonks in Westminster. Lord Gulam Noon, the so-called “curry king” who swept to notoriety when he became involved in the cash-for-honours scandal back in 2006 (an investigation later found him innocent), is also a vocal and self-interested apologist for the Bahraini regime. Senior members of the House of Lords admitted to me that “they’ve never heard of the guy” until I wrote about him a few weeks ago, so paltry are his usual contributions to the House. 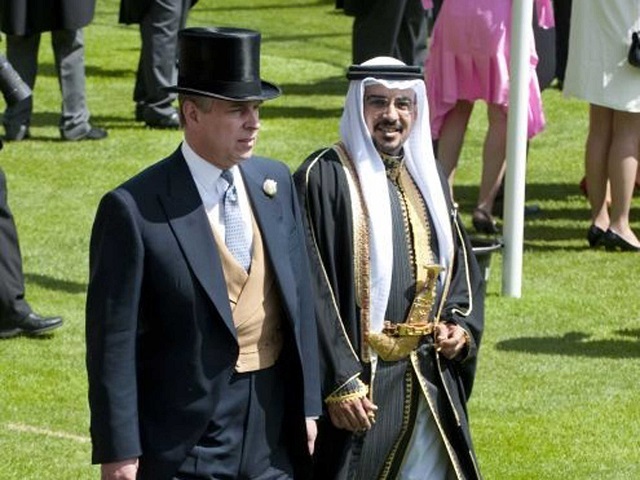 Alongside British ministers and Lords of the realm, The Queen, The Duke of Edinburgh, Prince Charles, Prince Andrew have all made or hosted visits to the al-Khalifas. Perhaps there is a fraternal bond between monarchs? A pity that such a bond is being enjoyed at the taxpayer’s expense. In 2012, the Duke and Duchess of Cambridge, Prince Harry, the Duke of York and Princesses Beatrice and Eugenie and the Earl and Countess of Wessex all attended a lunch with the King of Bahrain in London. Human rights groups slammed the meeting. In a particularly irksome meeting Prince Andrew told a recent press conference in Bahrain: “I believe that what’s happening in Bahrain is a source of hope for many people in the world and a source of pride for Bahrainis”. His organisation, which promotes expat interests in Bahrain, is also holding an event this week to further promote ties between the two countries. Mainstream British (and American) outlets are also to blame for the British public’s distorted perception of Bahrain, for not maintaining the laser focus the country enjoyed during the opening weeks of their Arab Spring, and for not raising more regularly the issue of why the UK is prepared to be so hypocritical in their support for such an autocratic regime. It has admittedly been hard to sustain that initial level of coverage over three years: there is a natural half-life for news stories. But still, the responsibility of journalists is to raise important issues in the public psyche, and uncover new angles. Investigations and scoops can ensure Bahrain’s near blanket banning of international journalists does not result in a media black-out. Bad things happen in the dark. Without the spotlight of journalism shining bright on Bahrain, where press freedom is a sick joke, the pro-democracy struggle will lose a key ally in the British people. Many British pundits are also consistently and carelessly referring to Bahrain’s pro-democracy struggle as “sectarian.” This negligence effectively ensures the Bahraini struggle regresses to the back of the public psyche : just another example of sectarian strife in a region our media tells us is primarily characterised by sectarian strife. Admittedly the situation is complex and at first-glance might appear that way – many of the pro-democracy activists are, indeed, Shia and many of the police forces are Sunni. But the fact that political oppression coincidentally falls along sectarian lines does not mean this is purely a sectarian struggle. And in any case, many Sunni Bahrainis also advocate political change. Rather, the Bahraini people’s struggle should be presented by the British media for what it is: the bravest Arab Spring that never happened, still struggling three years later and dedicated to fixing the huge power imbalances, inequalities and injustices inherent in the monarchic system. Finally, British editors are afraid to publish anything too damning – one national newspaper editor told me on pitching a story “We need to be very careful when we’re dealing with the Gulf states, those people are famously litigious.” According to an op-ed writer for The Guardian, the paper was threatened with legal action after he wrote a piece criticising the presence of that year’s Formula One Grand Prix in Manama. The Independent reportedly had similar difficulties. The UK establishment’s obsession with Bahrain is two-fold. First, there is a military aspect. The highly strategic US 5th Naval Fleet is stationed in Manama harbour. The British military also have several key assets there, and are seeking to expand their presence. The base provides a perch for air, land and sea units from the West. In theory, these troops form a buffer against Iran, but conveniently offer a cloak of protection to our oil-rich friends in the GCC (who prefer the West to do their fighting for them). The base is also used to launch occasional but bloody conflicts prosecuted by Washington and London hawks, as well as reducing piracy in the shipping lanes off the Gulf of Aden. Secondly, there is also a lot to be earned, financially, for the British establishment remaining friends with the al-Khalifas. Though a tiny country, Bahrain’s fate is closely observed by Saudi Arabia and the United Arab Emirates. In the most famous demonstration of regional support for the Bahraini regime in recent years, Saudi and Emirati tanks rolled across the causeway back in 2011, menacing the pro-democracy activists who thronged the Pearl Roundabout. While British trade with Bahrain is sizeable, it pales in comparison to the financial rewards on offer if the UK can keep Riyadh, Abu Dhabi and Dubai sweet. These regimes close ranks to defend similar autocracies, and it is an unconditional part of UK and US commerce, and defence policy, that the Bahraini monarchy remains in power. The human rights situation in Bahrain, despite what the British government and numerous shills for the al-Khalifas say, has deteriorated rapidly since 2011. Online critics are facing increasing challenges. Protests are restricted now more than ever. There has been little progress on the promised reforms, a few token charges of torture have been made but against low-ranking officers, who often receive light sentences, are released early, or see charges dropped on appeal. The watchdog organisation, Bahrain Watch, have been tracking the implementation of these promised reforms, and the results don’t make for pretty reading. Meanwhile, an investigation by Amnesty International revealed how the regime is regular torturing children, Even the US State Department, no saint when it comes to human rights and also holding a strong military interest in Bahrain, has released forty nine pages of bruising criticism in their latest report into global human rights. In contrast, Bahrain has not even made it onto the “countries of concern” list in the UK’s latest assessment of global human rights abuses. There’s a legitimate argument to be made that governments must act so as to both secure and enrich their citizens. But the question must always be – at what cost? There is no hypocrisy greater than the British establishment, who claim to advocate liberal democracy and cheered on the Arab Spring with gusto. When it came to Bahrain – our leaders have fallen silent. Now, three years on, key members of the establishment continue to shill for the al-Khalifas, mainly at British taxpayers’ expense, and with concern only for their own careers, personal enrichment or misguided foreign policies. It’s time they were held to account for it. There is no hypocrisy greater than than ….. a British reporter who knows nothing about the subject matter he is writing about. If you can write that the NGO Americans for Democracy and Human Rights in Bahrain are an independent watchdog you obviously are living in cloud cuckoo land. Human Rights Watch didn’t you read The Corruption of Human Rights Watch BY Tom Malinowski, longtime director of Human Rights Watch’s Washington office, he was sworn in as Assistant Secretary of State for Democracy, Human Rights and Labor on April 3, 2014. I know many of the HRW observers directly and am privy to the exact way they pull together their reports. There is no doubt they do it impartially. There is no also doubt HRW operate under a small amount of pressure from the US govt, as any organisation within a sovereign state must do. This may result in an attitude of moderate self-censorship at a head office level. That said, the numerous critical reports HRW have composed about the US government over the years suggest that this is limited to a few cases. You should note that the letter references grievances for HRW’s unprofessional treatment of alleged human rights violations the US govt has committed against Venezuelan govt, Syrian govt, and Al Qaeda only. None of those entities are bastions of morality. The letter also does not query HRW’s negative assessment of Bahrain, an assessment which matches with a number of other credible human rights organisations as well as, to a certain extent, the US State Dept. It also matches with the numerous eye witness reports I have assembled since February 2011.